We will also consider publishing other pieces not listed above - contact us to discuss your idea. Students are to be the primary author of articles and all the work presented therein should be a product of their effort, or appropriate acknowledgements and permissions given. Any work previously submitted as an assignment should be re-written to align to our format, and appropriate permissions given from the staff member who set the work. You can find the rest of our journal policies here. Publishing with Insider Imprint is an excellent opportunity to showcase your achievements and enhance your CV. As an open access online journal, you will gain visibility for your accomplishments. Whether you are interested in staying in academia or have alternative career goals, having a published article or two is a sure way to increase your employability and impress potential employers. Publishing with us will give you experience in how you go from an idea to print. We will guide you through the typical publication roadmap, from following author guidelines, submitting your work & receiving feedback to reviewing proofs before publication. You will also gain an insight into the peer-review process that is widely used to validate scholarly work. For those of you interested in staying within academia, getting your first publication can be a big step forwards for your career and will help break down barriers early researchers often face when contemplating their first article submission. And of course the transferrable skills you will gain are invaluable for many other careers such as in science journalism, teaching, policy making, patent law, consultancy etc.. 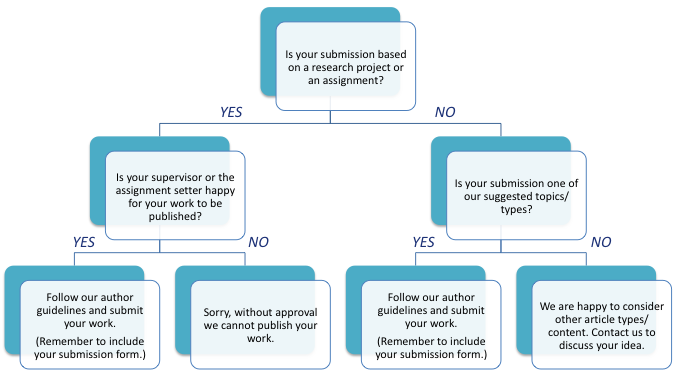 If your work is based on a research project, or an in-course assignment, check with your supervisor or assignment setter that they are happy for you to publish this work. Prepare your submission, following our article guidance and style guide below. Download our Submission Form & Declaration here and complete it fully, including obtaining permissions where needed. Submit your work along with the submission form to insiderimprint@liverpool.ac.uk. Choose the format most suitable for your article, and follow the related instructions below for how to prepare your submission Please also read the generic style guide instructions below. We encourage you to consider publishing work related to your studies, such as your research project or a dissertation. Note however that your work will need to be written and formatted according to our journal requirements. A short summary (no more than 300 words) should be included at the beginning of your article to briefly and clearly explain the aims and findings of your work, in terms which could be understood by persons from outside your area of expertise. - No more than 250-500 words. Should provide a succinct summary of your article. Should be submitted as separate image files in one of the following formats: *.jpg, *.png, *.tif. File names should specify the figure number e.g. ‘figure 1’ etc. The corresponding figure legends should be within your word file after your reference list. Figures should be submitted as separate image files in one of the following formats: *.jpg, *.png, *.tif. File names for figures should specify the figure number e.g. ‘figure 1’ etc. The corresponding figure legends should be written at the end of your word file. We welcome original artwork or creative submissions that have a connection to the life sciences. Images should be of appropriate size and sufficient resolution to be printed on an A4 page or half page (maximum 8 x 11.5 inches). Please scan your artwork into a computer - images taken from cameras will not be accepted. Submitted as one of the following formats: *.jpg, *.png, *.tif. Please contact us if you need guidance regarding image resolution. Artwork should be accompanied by a short description of the work. Please ensure your submission has been formatted to match the journal style guide given here. Each citation is given a unique number, written in brackets in the text, e.g. “The authors suggest further research is required (1)”. The reference list is ordered according to number, in the order in which the citations appear in the text. 1. European Space Agency. Rosetta: rendezvous with a comet. Available from: http://rosetta.esa.int [Accessed 15th June 2015].